If Walter Van Beirendonck AW17 is still on your mind, I get it (and you should get thee to the stores)! What made that show linger on the brain – and I also loved SS18 – was the hypnotic passage of Austrian band SEIDÄ PASS and their demonic masks paired with the models in their silk-covered faces. You know Walter Van Beirendonck loves a good mask, so it’s only natural that in a new expo opening at Wereldmuseum Rotterdam on September 1 called “POWERMASK”, the icon of Belgian design has curated a selection of art that explores the infinite and mystical functions of masks. 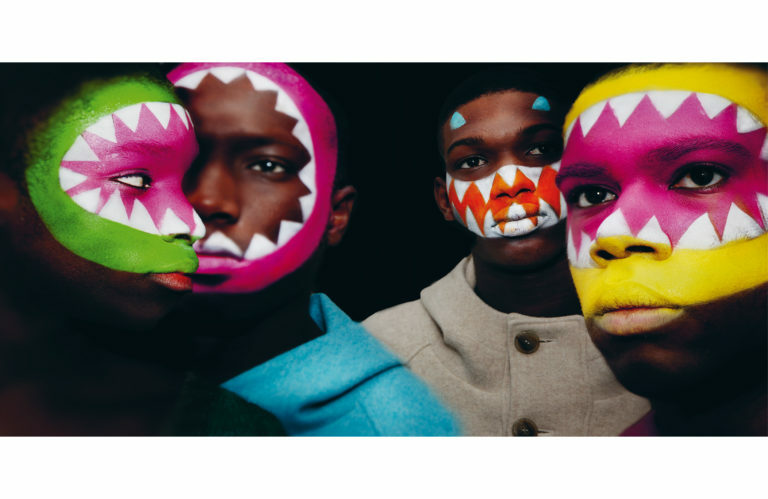 Since the genesis of his namesake brand, Walter Van Beirendonck has involved masks in his collections, from the AW89 “HARD BEAT” bright balaclavas to the transformative pierced-nose lambskin specimens at AW12. Masks add dimension and atmosphere that few other items of clothing can. They conceal but project at the same time. As a curator, Walter Van Beirendonck selected over 125 masks from the Wereldmuseum archive to investigate the use of masks throughout history: as supernatural, ritualistic, and inspirational items. The expo also delves into the role of the mask in modern art and contemporary high fashion by placing them side by side with art, photography installations and fashion by the greatest artists of modern times. “POWERMASK” features works from Viktor & Rolf, Jean Paul Gaultier, Keith Haring, Diane Arbus, Jean-Michel Basquiat, Louise Bourgeois, Brian Kenny, Martin Margiela and Dirk Van Saene plus many more. I’ll just grab my Alexander McQueen “Horn of Plenty” paper cut-out mask and meet you there. An accompanying book “POWERMASK – The Power of Masks” with contributions by Walter Van Beirendonck, Kaat Debo, Chris Dercon, Alexandra Van Dongen, Clémence Mathieu, Valentine Plisnier, Jan Willem Sieburgh, Fanny Wonu Veys and Sonja Wijs will be published on August 29. The book, brandishing the Sally Wassink piece “Postcard (after Hoch)”, contains 240 pages and its graphic design was created by longtime Walter collaborator Paul Boudens. A first look reveals beautiful juxtapositions of inspiration meeting art by the biggest names. We’re talking Giorgio de Chirico, James Ensor, Craig Green, Stephen Jones, Inez van Lamsweerde, Robert Mapplethorpe, Christophe Coppens, Gustave Courbet, Paul McCarthy, Niels Peeraer, Pablo Picasso, Cindy Sherman, John Stezaker and many more. Pre-order the POWERMASK book here.